Gingerbread man is one of the iconic images of Christmas, but who is he and why we associate this cookie with the holiday season so much? This cute festive treat has a curious history (and you can find a simple and healthy recipe at the end of the article!). Before ginger came to Europe via the Silk Road, it was already used for sweet treats in other parts of the word, and the very first recipe of gingerbread is considered to be coming from Ancient Greece. It became a common festive treat in England in the Middle Ages and it was a favourite item sold at the markets. In those times there was no gingerbread man though, and the cookie was often made in the shapes of different animals, or even kings and queens. Queen Elizabeth I is believed to have been the first “creator” of gingerbread men – for her entertainment, the cookies were made in the shapes of her favourite suitors. It was a fun and delicious treat at the royal dinners during the festive season! In some part of England it had a different symbolical meaning: young maidens would bake and eat gingerbread men on Halloween, believing that it would bring them luck in finding a real husband soon. At some point human-shaped cookies found its use even in witchcraft. Witches would bake the avatars of their enemies and simply eat them! Its status of a modern holiday season symbol gingerbread man owns to an American St. Nicholas Magazine publication “The gin-ger-bread Boy”. The story tells about a living cookie (a gingerbread man) who runs away from everyone who wants to eat him, but finds his unfortunate end in the fox’s mouth. The author of the publication claimed that his children heard this story from a servant girl, and similar tales indeed exist in folklore of different countries. Nowadays, gingerbread man is not just a favourite Christmas cookie, but also a famous character in popular culture, who even took a prominent role in the famous cartoon “Shrek”. No wonder, that one of the favourite family activities during the festive season is to “dress up” a gingerbread man with colorful frosting, and imagine that he comes to live! Step 1. Mix together flour, coconut, ginger, cinnamon, baking soda and ghee. Step 2. Whip eggs together with jaggery (you can just do it with the fork). Mix together with the rest of the ingredients. Step 3. Knit the dough and roll it out to a 0.5 cm thickness. Step 4. 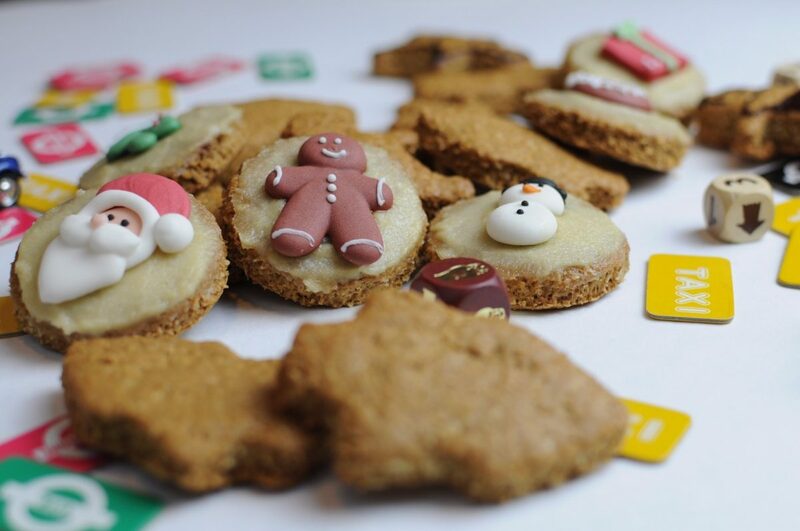 Cut your cookies with your favourite cookie cutters and bake at 180°C for 15 minutes. Your gingerbread men are ready! Starting your day healthy and delicious is easier than you think, we’ll show you how to do it! These are amazing. Love the way they look. Kind of inspired me to tackle these on Sunday! And a great story to go with it, too. Merry Christmas! Love this! Your adding the history along with the recipe was the perfect addition to this already delicious post! wow! Thanks for sharing this! This looks cute and I want to try your recipe! Nice!